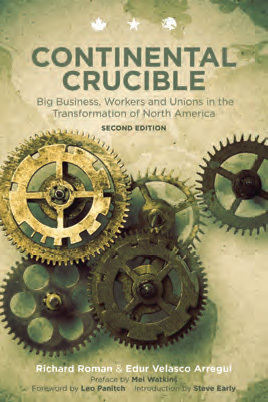 Continental Crucible (2nd edition, 2015, PM & Fernwood) examines the clash between the corporate offensive and the forces of resistance from both pan-continental and class-struggle perspectives. It argues that there is a potential synergy between the cross-border character of the Mexican working class and the cross-border character of "international" (U.S.-Canadian) unions that could re-energize the North American labor. This synergy, however, can only develop in relation to a transformation of the labor movements in all three countries towards inclusive, internationalist, and class struggle unionism. This second, expanded edition examines recent developments in the big business offensive, especially the blitzkrieg of constitutional reforms in Mexico in 2013–14. RICHARD ROMAN is associate professor emeritus of sociology at the University of Toronto, a fellow of the Centre for Research on Latin America and the Caribbean at York University, and a member of Socialist Project and the Greater Toronto Workers' Assembly. EDUR VELASCO ARREGUI, a professor of law and labour economics at the Universidad Autónoma Metropolitana in Mexico City, was Secretary General of the Sindicato Independiente de Trabajadores de la Universidad Autónoma Metropolitana from 1994-1996 and continues to be an important trade union dissident/activist in Mexico. IMMANUEL NESS is a political economist and professor of Political Science at City University of New York. He edits Working USA: The Journal of Labor and Society and is the author of numerous works including Guest Workers and Resistance to U.S. Corporate Despotism, and the forthcoming Southern Insurgency: The Coming of the Global Working Class. He has worked and organized in the food, maintenance, and publishing industries.